Society has a way of deciding what you need to do. If you try to do things differently, they think you’ve lost your mind. Our culture dictates you go to school, get a job, get promoted, get married, get kids. Work, resign and die. Sometimes things won’t work like this for you. You may not get your dream-job that will give you the money you desire. Disappointments may discourage you, and you will find yourself getting depressed. It’s always easy to follow the crowd and do what’s expected or considered the norm. But you can change the trajectory of your life by planning and having goals that work. I have big dreams and visions and sometimes I’m even scared of them. When I use a vision board, I can focus and see how I’ll achieve them. In this article, I want to talk about how you can achieve your dreams and goals. What really matters to you? Where do you want to be in three years or five years? Is it what everyone thinks, what your relatives say, or do you have your personal goals? What keeps you awake at night? What would you love to see happen? Do you want to travel to exotic destinations like visiting the pyramids in Egypt? Maybe you want to own a house at a particular location. Or you want to go to college. Or you want your kids to attend a particular school. What you value is critical to making you succeed in your goals. It is often referred to as your WHY. Make plans that will make your goals come alive. Start with making small bite-size goals. When you have a big dream, it may seem overwhelming and impossible to achieve. However, when you make small reachable goals, it begins to take shape. This is the part that most people tend to leave out. Your initial action can be as small as starting a website. Purpose to take small actions every day. Taking action may mean waking up earlier than usual to work on your dream. It may mean doing a course to better yourself or moving to another city. Have you heard many people say that when you have a vision, the universe agrees with you and allows situations to happen that make your dreams come true? Beware of your limiting beliefs which will quickly kill your dreams. Limiting beliefs will make you doubt what you can achieve. Whatever your goal is; put the final vision in front of you so you can focus on where you are going. 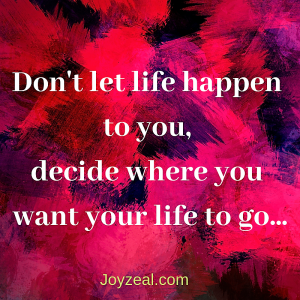 Don’t let life happen to you, decide where you want your life to go. For more Tips, enter your Email now. This is true, write down your goals and visions then pray and work towards them. Happy New Year! Yes Antionette, the crucial part is Work toward them.